"A voice like yours," celebrated conductor Arturo Toscanini told contralto Marian Anderson, "is heard once in a hundred years." This insightful account of the great African American vocalist considers her life and musical career in the context of the history of civil rights in this country. Drawing on Anderson's own writings and other contemporary accounts, Russell Freedman shows readers a singer pursuing her art despite the social constraints that limited the careers of black performers in the 1920s and 1930s. 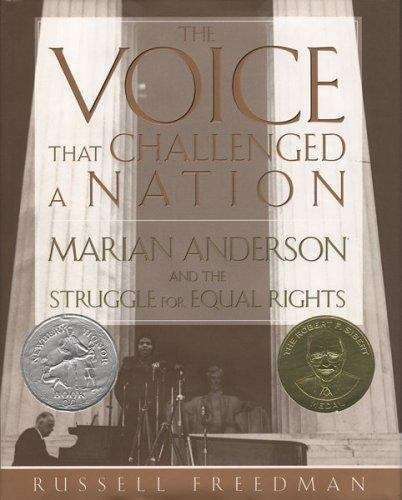 Though not a crusader or a spokesperson by nature, Marian Anderson came to stand for all black artists -- and for all Americans of color -- when, with the help of such prominent figures as Eleanor Roosevelt, she gave her landmark 1939 performance on the steps of the Lincoln Memorial, which signaled the end of segregation in the arts. Carefully researched, expertly told, and profusely illustrated with contemporary photographs, this Newbery Honor and Sibert Medal-winning book is a moving account of the life of a talented and determined artist who left her mark on musical and social history. Through her story, Newbery Medal-winning author Russell Freedman, one of today's leading authors of nonfiction for young readers, illuminates the social and political climate of the day and an important chapter in American history. Notes, bibliography, discography, index.